1. What is DiskOnModule (DOM)? DOM is a flash module built on PCB, with either a 40 or 44 pin IDE interface. DOM works just like a hard disk (hence the “disk” on “DiskOnModule”) but without the problems associated with a hard disk. No need to worry about hard drive crashes due to mechanical breakdowns. DOM has no moving parts! We don’t have a spinning flying disk, or hard drive heads that mechanically read that flying disk. Our DOM does not generate any heat, is not climate sensitive, and will last for years! Our device remains cool, secure, and most of all, RELIABLE! 2. How is power supplied to DOM? DOM comes with connector cable which allow you to connect DOM to 4 PINs SMPS connector. hence you can supply power to DOM exactly the way power is supplied to computer HDD. This is required only in case of 40 pins DOM. 3. What is 40/44pins ? Regular IDE connector on standard computer motherboard has 40 pins connector whereas some other computers like Laptops or special motherboards have 44 pins connector. In case of 44 pins connector the power is also supplied from same IDE connector and HDD or DOM does not require any external connector for power supply. Simple 44-40 pin converters are also available in case you have any problem. DOMs are available in 40 pins or 44 pins models to support all boards/systems. Normally 40 pins DOMs are used. 4. How do I mount DOM? You need to just insert DOM module in 40/44 pins slot and do not need to use IDE cable etc. or mount it at some other place. It is vertically mounted on the motherboard and grabs itself strongly in the slot and does not require any clamps. 5. Can I replace my computer HDD with DOM? Yes you can replace your computer HDD with DOM and everything work the same way except the amount of space available to you is very less. e.g. in 256 MB you may only be able to install small OS and have some space for storing data. Few companies have launched 1GB Flash disks and soon you may be able to do lot of tasks with DOMs. 6. What if my requirement is of other then 32, 64 and 256 MB? The price difference between 16 & 32MB is insignificant. same is with 48, 64 & 96 MB. Hence it is recommended to use 32MB instead of 16MB and 64MB instead of 48MB. You can use DOM like a HDD and install operating systems like Linux, Unix, Windows 98, Win CE, Embedded XP, QNX, RTOS etc. or use it for data storage as per its size. 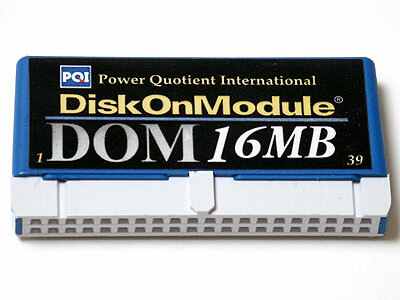 DOM's are available in different memory sizes like 16MB, 32MB, 64MB, 128MB, 256MB, 512MB and more. One Solutions Partner and the Distributor for Apacer Technology Inc. for Asia, Regions, specialized in Apacer Industrial Embedded SSD Flash Solutions. Apacer Industrial Grade Embedded Flash Products meet and Quality Standards. Apacer offers only the highest of quality products to satiate the rigorous demands in stability of storage modules for the industrial computer markets. Apacer's Embedded SSD products undergo extensive reliability testing (temperature, humidity, vibration, and shock tests etc.) and ORT testing (ongoing reliability tests) to guarantee the product dependability and longevity support. Please email to our Apacer Industrial Grade Embedded Flash Products Specialist -for your special OEM requirements.